Tax dollars are allocated to financing the war and the "bank bailout"
Excerpts of Michel Chossudovsky’s March 2009 article entitled America’s Fiscal Collapse. The “bank bailouts” (involving several initiatives financed by tax dollars) constitute a component of government expenditure. Both the Bush and Obama bank bailouts are hand outs to major financial institutions. They do not constitute a positive spending injection into the real economy. Quite the opposite. The bailouts contribute to financing the restructuring of the banking system leading to a massive concentration of wealth and centralization of banking power. In turn, the financial elites will use these large amounts of liquid assets (paper wealth), together with the hundreds of billions acquired through speculative trade, to buy out real economy corporations (airlines, the automobile industry, Telecoms, media, etc ), whose quoted value on the stock markets has tumbled. 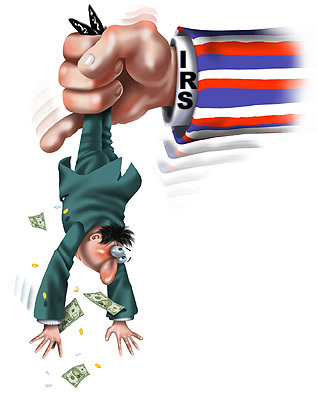 Moreover, as a basis of comparison, all the revenue accruing from individual federal income taxes ($1.061 trillion), (FY 2010) namely all the money households across America pay annually in the form of federal taxes, will not suffice to finance the handouts to the banks, which officially are of the order of $1.45 trillion. This amount includes the $700 billion (granted during FY 2009) under the TARP program plus the proposed $750 billion granted by the Obama administration. While TARP and Obama’s proposed bailout are to be disbursed over FY 2009 and 2010, they nonetheless represent almost half of total government expenditure (half of Obama’s $3.94 trillion budget for fiscal 2010), which is financed by regular sources of revenue ($2381 billion) plus a staggering $1.75 trillion budget deficit, which ultimately requires the issuing of Treasury Bills and government bonds. The budget deficit is of the order of $1.75 trillion. Obama acknowledges a 1.3 trillion-dollar budget deficit, inherited from the Bush administration. In actuality, the budget deficit is much larger. The fiscal crisis is further exacerbated by the compression of tax revenues resulting from decline of the real economy. Unemployed workers do not pay taxes nor do bankrupt firms. The process is cumulative. The solution to the fiscal crisis becomes the cause of further collapse.